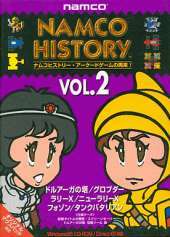 This is the second of four compilations in the Namco History series. It contains the following games: The Tower of Druaga, Rally-X, New Rally-X, Phozon, Grobda, Tank Battalion. The games are the arcade versions running under emulation and are faithful replications of the original titles.